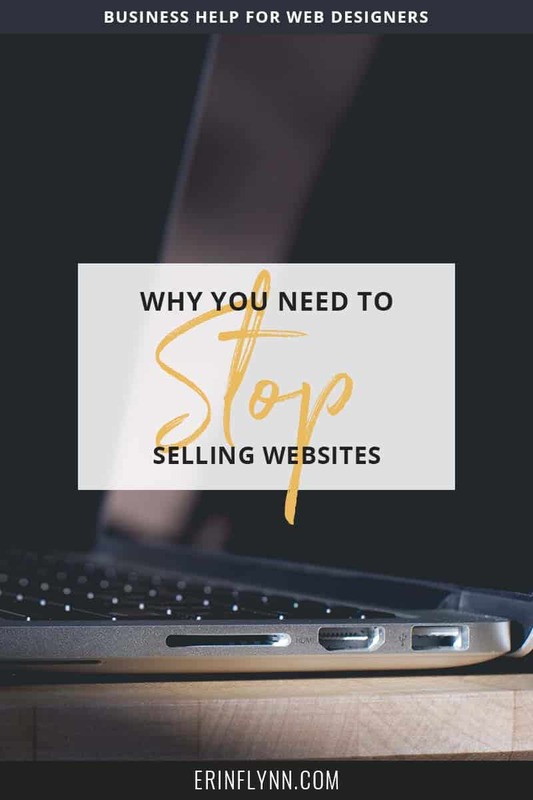 Stop selling websites RIGHT NOW! Look, we’ve all been there. A client is haggling your price down because So-and-So over at that other design business says she can make a website for half the cost. And you start to worry that the client will hire So-and-So instead. Websites aren’t a commodity. They’re not like gasoline, where you stop at whatever gas station has the lowest price, because the end product is the same. But a lot of clients don’t get that. And a lot of web designers don’t either. In my career as a developer, I can’t tell you how many designers I worked with where THEY treated the website like a commodity. Something to slap a logo in and call it a day. That’s all the client asked for, right? They tell you they want a website, but that’s not true. In fact, it may be hard to get them to say anything besides, “We just know our business needs a website,” which is incredibly unhelpful. But whether the client knows it or not, they don’t want a website. What clients want are more customers, or at the very least more leads. On a rare occasion they may want a resource for visitors to reduce their workload by reducing the number of questions they’re asked. But no one ever wants just a website. Yet designers continue to deliver, just websites, and wonder why they can’t charge premium prices. They wonder why they are constantly beat out by So-and-So’s lower rates. They compete to get low-paying clients. They never stop to think that maybe they’re selling their services all wrong. You have to ask clients why they want a website. And keep asking until you get to the root of the request. Clients may not even know why they want a website until you ask them. Clients may not even know why they want anything; a website, SEO, a new logo, whatever. You have to keep asking why until you get to the real reason. Even if YOU know that the client needs a website in order to attract more customers, you have to take the client on that journey so that they realize it themselves. When a client realizes you’re going deeper than So-and-So, that you’re offering a solution to their problem, they’ll understand why you charge more. But you have to ask them WHY first. Clients don’t know that they don’t want a website–you have to ask what they want! Client: I want a website. Designer: Great! I can make you a website. What do you do, and who is your target market? Client: I’m a wedding photographer and my clients are brides. Designer: Great, we’ll use watercolors and put a big image slider on the front page. And that’s about as deep as it goes. The designer makes a beautiful website with lots of big images and a pretty color palette, and the client pays for it. But what does the website DO? Well it looks great, so the designer’s job is done, right? As a web designer, you have to determine the client’s goal (in this example and most: get more clients), and create a design that accomplishes this. And I hate to tell you, but there’s a lot more involved than creating a pretty brand and slapping it in a website. That may have worked in 2002, but today, that no longer flies. Every element of design should serve a purpose, and that purpose is to lead visitors toward the goal. When a visitor first lands on the website, we want them to be blown away by your photography. We’ll showcase a few of your best photos, that demonstrate the type of weddings you like to photograph on the home page. From there, we want visitors to learn a little about you, so we’ll funnel them to your About page where you can explain how you can help them get the best wedding photos possible. At that point visitors should be pretty psyched, but we want to drive home who you want to work with and the types of weddings you shoot just a little more. So we’ll direct them to your portfolio where we’ll showcase a few of your favorite weddings. Finally, we’ll direct visitors to contact you, and we’ll make that as simple as possible with a custom form that collects all the info you need upfront. This website will draw in visitors and streamline the intake process. Making it easy for clients to hire you, and reducing back and forth emails for you! Which do you think clients would pay more for? The thing a lot of web designers get hung up on is tech. They list out a ton of features and expect the clients to see the value in them. But clients have no clue what you’re talking about. Tech means nothing to them. Or at least very little. You might get the odd client who knows they want a certain plugin, or at least knows they want to be on WordPress instead of Squarespace. But the majority of clients don’t care about tech. What clients do care about is results. More customers. More leads. Less work on their end. THAT is what you sell. Selling a WordPress install with a custom theme and five page templates means zilch to your clients. But when you’re offering that, and So-and-So is offering the same but with SEVEN page templates, for the same price, you’re both just commodities. And So-and-So will beat you, every time. You have to sell the benefits. And if you can, actual results. If a past client has gotten more customers and more business because you built her a website-sell THAT. Instead of focusing on the tech, focus on how the website will benefit your clients. How they’ll see better results. Suddenly, you can put yourself in a whole new price bracket. Suddenly, clients see the value you are bringing them, and see you as more than a pixel pusher, but instead as a consultant. They start to value your opinion, and defer to your expertise. You might be selling the exact same thing you were always selling, but you changed your positioning from a commodity to an authority. Learn how to sell the benefits of what you offer! How much would you pay for something that was going to get you an extra $100,000 a year? $5,000? $10,000? $50,000? More? People will pay more money for something, if they believe it will make them more money. It’s simple math for the client-pay $10,000 for a website and get $100,000 in extra revenue a year. Worth it. But not every designer is comfortable in talking money like that. After all, you can create the best website in the world, but if the client doesn’t do anything to get traffic to it, there will be no return on investment. You should never guarantee a result. The best you can do is share past clients’ success, and tell potential clients what’s involved in getting there. But you don’t have to base value purely on monetary gains. Value comes in many forms. If you can streamline a client’s site so that customers can book a photography session more easily, that’s value. If you can create an intake form that helps cut down on your client’s back-and-forth emails, that’s value. If you can add an FAQ section that reduces the amount of questions your client receives, that’s value. But you do need to put a price tag on the value you’re providing. I’ve shared an income calculator that has a simple method for creating a package price. Long story short, figure out how much you need to make each month, and then create a website package to support that. When you add value to the mix, you’re able to easily support that package price–or even raise it. Think of all the value you can add to a project. Write it down. Then add a price tag to each value point. You’ll be surprised at how quickly it adds up, and how badly you’ve been undercharging. Web design isn’t a commodity. Don’t treat it that way. Clients say they want a website, but in reality, they want customers, and they want to make their processes easier. You have to ask them why they want what they want until they get to the root of the request. When they get there, they’ll start to see that they need more than a website, they need a solution. Tossing a little strategy in goes a long way. And it’s not that hard once you know what your client’s goal is. Seriously, that strategy section took less than 5 minutes to write from scratch. For most clients, the end goal will be the same, so you can use a template and tweak as needed. To sell your value you need to sell the benefits, not the tech. Clients don’t care about what plugin you’ll be using, they care about results. Putting a price tag for yourself on the value that you offer clients lets you see what you’re really offering. And that you’re worth more than you’ve been asking.